Dave and Sherrie Rabellino are optimists. The high school sweethearts got married and launched their first trade-shop repair business almost immediately after graduating high school. By the time they were in their mid-20s, they decided to use their $75 in savings to open their first jewelry retail store, The Goldsmith Jewelers in Santa Rosa, CA. When Dave suggested the plan, Sherrie was immediately on board. "I said, ‘OK, let’s go!’" she recalls. "When you’re young you’re not as cautious as when you’re older. And we didn’t have any other plans." And while you might attribute their early entrepreneurial bravado to youth, they can look back at those days without even recalling any major missteps. "We don’t dwell on mistakes; we don’t even think about it," Sherrie says. "We adapt, for sure, to the economy or to people we have working with us, or to hot new products." Optimists, still. When Dave was a teenager, his parents owned a restaurant across the mall from a jewelry store. He learned his work ethic from his parents, and he learned jewelry repair at the jewelry store and eventually took over the retiring owner’s wholesale accounts. He learned to make jewelry in his garage, pounding out silver dollars to generate material. A local Girl Scout Troop visited the store last year to learn how jewelry is made. Goldsmith Kevin O’Neill led them on a tour of the workshop and helped each girl make a sterling silver twisted wire ring, which they took home, along with the jewelry badge they had earned. as well as jewelry design. With a young family, they relocated to Prescott, AZ, and soon recognized the opportunity to take the jewelry store experience to the next level in a town where JC Penney was the leading jeweler and their other competitors seemed mired in tradition and dedicated to selling basics. 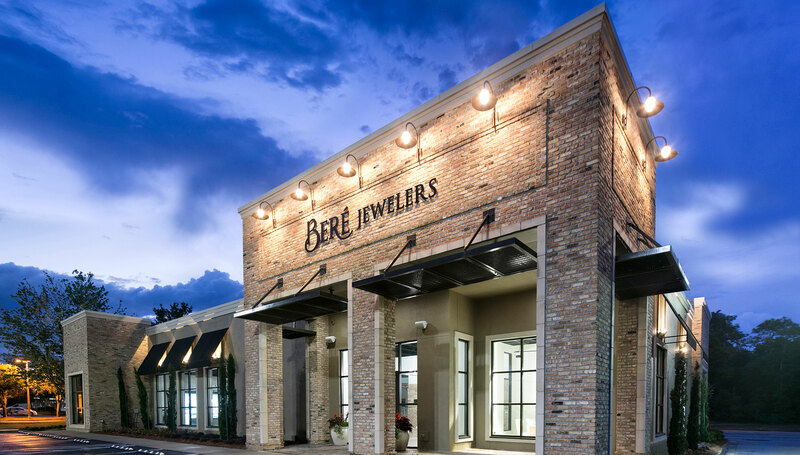 Dave and Sherrie stayed abreast of style trends and designed their own innovative jewelry, which quickly set them apart when they opened Artful Eye Jewelry Design Center. "Our name is the Artful Eye!" Sherrie says. "Talk about pressure to keep absolutely every piece of jewelry and every single detail in our store artistic and cool." In 2000, Dave remodeled the retail space, located downtown in the historical "whiskey row," which once was home to 27 bars. The 1903 building came with plenty of Old West character. Most recently it had been a cattleman’s shop, selling Western clothing and cowboy hats. The couple respected the integrity of the building, and in a 2013 update, they painted the walls, installed LED lighting and replaced pine floors with a rustic oak. They were happy to keep the original tin ceilings. Dave, a dedicated do-it-yourselfer who likes to restore old cars when he’s not making jewelry, led the remodel himself, assisted by a friend with construction experience. Earlier, Dave had also handcrafted the tile and marble mosaic entry way and all of the cases. Three of those cases sit atop old mining ore cars found in Arizona mines. The counter, too, is custom made — with wood pillars, rock faces and a shingled roof. Completing the look, above the cases, 11 old Winchester rifles are displayed as well as Gold Rush artifacts. All of these details keep customers in the store longer. Men tend to look at the guns and gold-mining artifacts, while women are drawn to the jewelry. "We welcome and wow them. We try to entertain them," Sherrie says, "We don’t let them just do a loop around the store and walk out." The most common reaction Dave gets to last year’s remodeling project is, "Are you available for hire?" But 2013 brought tragedy to their town, too, and made them realize how valuable their work could be. Because they have become such an integral part of the community, when the town lost 19 firefighters in June 2013 in the Yarnell Hill forest fire, the couple decided to handcraft 40 silver medallions for the wives and mothers of the fallen. The demand for the medallions surged, and within 30 days they had orders for over 1,000 pieces. By summer’s end, they had donated the resulting $19,000 to the firefighters’ families and given away pendants to other fund-raisers, which helped raise more than $500,000. Although support and funds poured in from all over the country, many of the bereaved have said that the simple silver medallion, the size of a silver dollar, has meant the most to them. Dave says the project has been the highlight of his career because it reinforced what it means to be part of the community as well as the sentimental value of jewelry. "Through tears, a lot of mothers, wives, sisters and friends have come in to personally thank us for making such a personal and special piece they can wear and keep close," Sherrie says. "We no longer wonder if what we do matters." Danielle Miele: I love how the store combines many aspects of both the family and the town to make it so individualized. The old-mine feel and lodge-style interior are my favorite aspects of the store. Leslie McGwire: Excellent first impression. The rustic Old West theme is innovative and one-of-a-kind. David Geller: I loved the fact they gave back to the community by giving out medallions in honor of the fallen firefighters and how much money it raised. T Lee: Having longtime staff really speaks to the culture and environment that they create in their shop. Their commitment to training the next generation demonstrates that attitude. Andrew McQuilken: The gem and gold-mining theme was a unique approach to tying the story to the building in the town. I particularly love the mining cart showcases. 1. THEY GO TO THE SOURCE. Sherrie is a graduate gemologist, and colored gemstone and diamond buyer. The Rabellinos shop the Tucson gem shows every year, hand-picking all of their raw material, particularly the distinctive, loose colored stones for which their jewelry is known. "We don’t buy 5 carats of this and 5 carats of that. We look for the unusual. When we come back, it’s like having a brand new box of crayons — we want to go to town working on it," Dave says. They’ve also begun traveling to Antwerp for diamonds. 2. THEY CELEBRATE THE OLD WEST. Eleven old Winchester rifles and a 1907 Colt Bisley revolver hang on the walls, while antique gold scales and gold-mining memorabilia in a museum case highlight the town’s 1863 gold-rush history. Three of their cases sit atop old mining ore cars discovered in Arizona mines. They also made a custom bead in the shape of an ore car with a local natural gold nugget, to commemorate the town’s sesquicentennial. 3. THEY’RE VERSATILE. At least 50 percent of jewelry is designed and made in-house, from start to finish, and at least 75 percent of all rings and pendants. Goldsmith Kevin O’Neill is best known for his lapidary skill and intarsia pieces. Holly Stringer, CAD/CAM specialist, recently designed a steam-punk style octopus to match a customer’s tattoo. 4. IT HAS A BEAUTIFUL THRESHOLD. The doorknobs are custom made of clear quartz crystal balls. Dave created the custom tile and marble diamond mosaic entryway. 5. IT’S GOT A FUTURE. Daughter Cara Pfeiffer joined the business and is on her way to becoming the second-generation owner of Artful Eye. She has used her business background to institute regular staff meetings and sales training and has developed written procedures for everything they do, helping to keep her parents organized.